A new version of Play Store has just started rolling out, and while some users will let it go unnoticed, those who are into beta testing will surely enjoy it. Play Store v6.7 has started rolling out, but as with all Google app updates, it’s hitting devices slowly. What’s notable about this update is that it makes it clear which apps you’re currently beta testing with a (Beta) tag at the top of the app listing. The Play Store will also indicate if you’ve got an unreleased app that was only ever in a private beta test. This update also makes it easy to join or leave a beta test from the app listing. 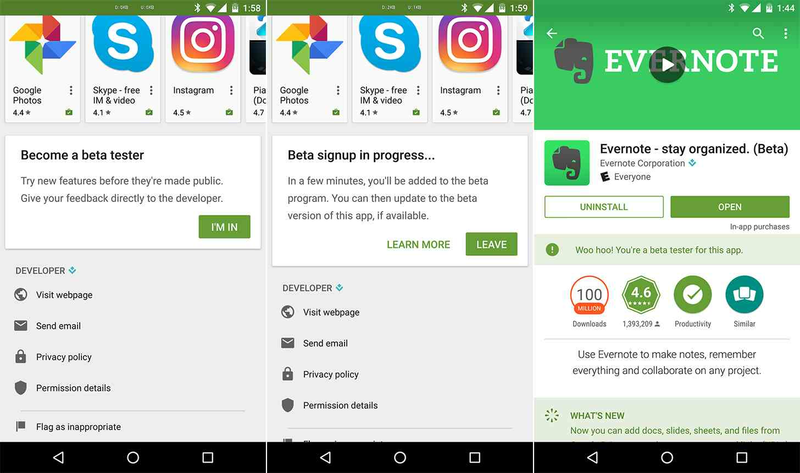 You’ll still need to join the app beta’s Google+ community if there is one, but after doing so, you’ll be able to install the beta from the bottom of the Play Store app listing. To leave a beta test, just scroll to the bottom and tap the Leave button. If you’re enrolled in an app’s beta test, you’ll now be able to leave feedback for the app’s developer on the Play Store listing. This feedback won’t be shown publicly. While this Play Store app update won’t mean much to folks that aren’t in any beta tests, for those that are, it’s a huge deal. It’s nice to finally have an indication of which apps you’re beta testing right there in the Play Store, and it’s also nice that there’s a button that makes it easy to leave a beta test if you’re tired of living life on the edge. As I mentioned before, this new Play Store is slowly rolling out, so it might be a few days before you get it. If you’re feeling impatient, you can sideload the app from APK Mirror.